L. A. Turbine (LAT) has announced the shipment of its first ARES active magnetic bearing (AMB) turboexpander-compressor to a new processing plant located in the Bakken Shale Play of North Dakota. 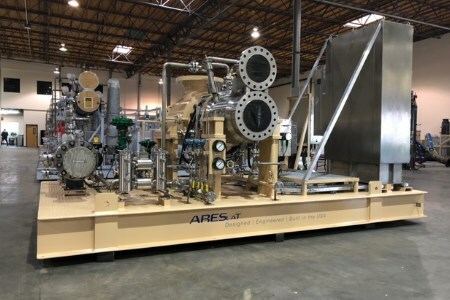 The ARES AMB turboexpander-compressor is designed for a plant flowrate of 200 million ft3/d and will be used for natural gas liquid (NGL) processing. Installation and commissioning are scheduled for 3Q19. Designed, engineered and built in the US, the ARES AMB turboexpander-compressor features LAT’s skid-mounted AMB control system and programmable logic control panel, made possible with a partnership between LAT and Waukesha Magnetic Bearings®. Until now, AMB controllers had to be installed in a building away from the skid installation site. The on-skid configuration gives equipment, procurement and construction (EPC) companies greater flexibility with the plant site layout, accelerates the design to delivery timeframe, and provides an AMB design technology at a price on par with standard oil bearing turboexpander units. The simplicity of design, ease of machine operation, and advanced magnetic bearing technology translates to operational and financial benefits for end users. Less time and labour are required for the installation and commissioning of the unit and AMB machines require minor ongoing maintenance. If an issue is reported, troubleshooting can begin immediately via the remote access capability of the controller.